In the biggest move to address the city's homeless crisis in decades, San Francisco voters approved Proposition C, a tax increase on corporations that would double the city's budget for homeless services. The measure was approved by 60 percent of the electorate. Proposition C, which pitted Mayor London Breed, who opposed the measure, against proponent Salesforce CEO Marc Benioff, took a strong lead Tuesday night, with "yes" votes totaling nearly 60 percent in early counts — tallying about 44 percent of expected ballots. "This is a major people's victory," said Jennifer Friedenbach, executive director of the Coalition on Homelessness, which sponsored Proposition C. "We're going to be able to transform the lives of folks who were out on the streets." The controversial measure could still face hurdles to becoming law. Some opponents of Proposition C have said that a tax measure directing funding for a specific purpose (in this case, homeless services) requires approval from two-thirds of voters. A state Supreme Court ruling last year opened up the possibility that a citizens' initiative like Proposition C could become law with a simple majority vote. But the majority-vote passage of a June measure to raise taxes for child care, also labeled Proposition C, was challenged in court. “Despite outspending the No on C campaign by at least 4:1, the Yes on C campaign failed to earn the two-thirds voter support necessary for San Francisco to ever see a penny that Proposition C promised," said Jess Montejano, spokesman for the No on C campaign, in a statement. A lawsuit could potentially delay the estimated $300 million that Proposition C would add to the city's annual homeless services budget. "If they sue us, we're going to be joining child care in that struggle, and we're very confident we're going to prevail," Friedenbach said. If Proposition C's passage is upheld, the job of overseeing an expected $300 million in new revenue would fall to Breed, who opposed the measure. Under the new law, taxes on gross receipts over $50 million would go up by an average of 0.5 percent. Proposition C was placed on the ballot by homeless advocates, who argued that a new funding stream was needed to pay for supportive housing, rental assistance, shelters and navigation centers. 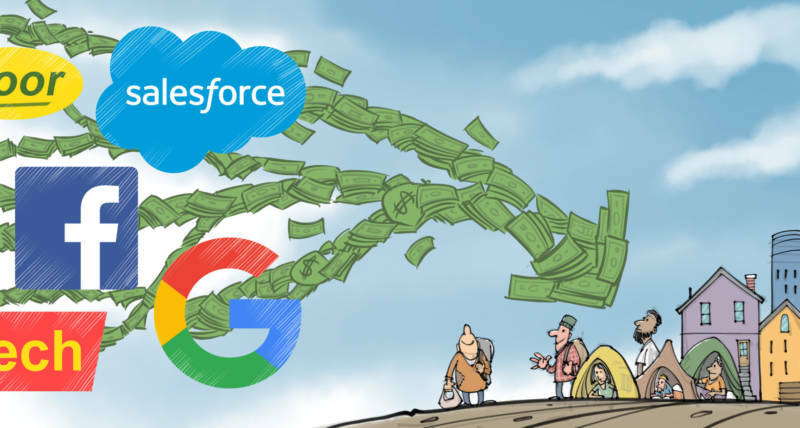 The campaign was given a surprise jump-start when Benioff announced his support of Proposition C. The cloud computing giant is one of the 300 to 400 companies that would pay an increased tax bill under the measure. But citing a dire need to address the city's most pressing problem, Benioff poured money into the Yes on C campaign. By election day, the yes campaign had spent more than five times as much as the opponents of the measure. Those opponents included the city's Chamber of Commerce and other business leaders, including Twitter CEO Jack Dorsey. Mountain View's Measure P, a local business 'head' tax paid per employee, had an even stronger lead Tuesday night — nearly 70 percent of votes were in favor with 66 percent of precincts reporting. More than half of the estimated new revenue is expected to come from Google. The funds will go to the city's general fund, though city leaders promised to use the money to fund upgrades to transportation. A third business tax, Measure HH in East Palo Alto, was up with almost 75 percent "yes" votes. It would add a $2.50 per square foot parcel tax on large commercial office space, to fund affordable housing. The measure requires a two-thirds majority to pass. KQED's Shia Levitt contributed to this report.